Duverney fractures are stable pelvic injuries. The fracture consists of an isolated fracture of one iliac wing. 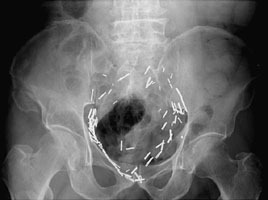 The pelvic ring remains intact although the patient is at risk for hemorrhage from the internal iliac arterial system. These fractures are caused by vertically directed forces. A AP radiograph of the pelvis. This shows a comminuted fracture of the right superior iliac wing. B AP radiograph of the right hip. The fracture lines are better seen. This patient fell.